"The book reads like a version of Whitman's barbaric yawp. It's wildly alive with the girl's unchecked bursts of word and emotion. The way she grasps at and simultaneously rejects love, wanting to be both acknowledged and left alone, is universal and timeless. The book exposes the slipperiness of what we so much believe to be true coupled with the shortcomings of the English language — German comes off better with words like fernweh (wanting to be anywhere but where you are) and fuchsteufelswild (gutting rage). It ends with the exhausted admission, "Somehow even while I am busy hating you … I love you." Tolstoy was after this realization, too, and it took him 1,000 pages." "... any parent curious to see how an author and illustrator can verbalize what, in many children, can only be expressed through frustrated fire and fury, will find in "I Hate Everyone" a balm and a friend they never knew they could have. Funny, quirky, brave, and strange, this little book takes its two tiny hands and furiously beats out a space for itself on your children's bookshelves." I HATE EVERYONE made it into THREE of School Librarian Journal blogger and librarian Elizabeth Bird's 31 lists of chidlren's books for December 2018. Click on the links to see the most amazing collection of beautiful books for kids. "bold, sophisticated" "hot mess of emotions"
"A little girl experiences big feelings on her birthday." A few words about my book I Hate Everyone—what I said at the book launch, slightly edited. It's just slightly embarrassing to publish a book with a title like I HATE EVERYONE. "Hate," as you know, is a strong word. After I read it to him for the second time my five-year-old grandson Gideon asked me: "Why did you write that book?" My first answer: I don't know. That's always my two-year-old grandson Gus's answer: If you ask him "What color is that?" He says, " I don't know. Green." My second answer: I don't remember. That's true too. Third answer is that I've worked hard to learn that sometimes in life we don't have the feelings we expect to have, and I have learned it's helpful to pay attention, to notice the feelings we have, not to ignore them. When years ago I started intensive psychotherapy and then psychoanalysis, I was a little worried that the therapeutic treatment would take away my need—my semi-secret wish since I was eight years old—to write, to tell stories in books. What I found is that it has enabled me to say things I never dreamed of saying before. I've been surprised to see that even just the title makes some people smile, and many people laugh. A few even said, "Hey, who authorized my autobiography?" And I suppose that is because, as Mark Twain once famously said—"Humor is tragedy plus time." Or as William Wordsworth said "poetry is emotion recollected in tranquility." Besides making people laugh, the title I HATE EVERYONE also seems to make people a little nervous. How could there be a children's book with a title like I HATE EVERYONE? They want to see how it turns out. This makes it suspenseful, if not a thriller, at least a certain kind of page-turner. This story is set at a birthday party. I suppose we celebrate birthdays because they are milestones, signs that against all odds, thank goodness, we have survived. And so they are sometime fraught with emotions. Over the years some of my favorite children's books have been about birthdays not being easy. Russell and Lillian Hoban's A Birthday for Frances, in which Frances goes with her dad to buy a chompo bar as a birthday present for her younger sister Gloria, and as they walk home she nearly eats it herself. Rhuksana Khan's Big Red Lollipop, where the oldest of three sisters in an immigrant family is told by her mother she must bring her middle sister along when she is invited to a classmate's birthday party. And the sibling love that emerges when the middle sister is invited to a party and the oldest sister tells their mother, don't force her to take the youngest sister along. And if we are looking at literary antecedents, since I am fond of locating myself in traditions, I might also say that in writing this book I was semi-unconsciously ambitiously aspiring to climb up and stand on the shoulders of Maurice Sendak, for Where the Wild Things Are, and Judith Viorst for Alexander and the Terrible, Horrible, No-Good, Very Bad Day. A word about perseverance. It took me ten years and just over 40 submissions—with several regretful encouraging rejections by publishers along the way, to find a happy home for this, my fourth book for kids. I'm so glad to have found a daring and visionary editor–Jordan Nielsen of Pow Kids Books—for believing in it. And it was Jordan who found, in Cinta Arribas, a wonderful illustrator. If you do the math, you'll realize I I wrote the text of this book long before President Trump was elected and before hate got to be so much in the news. A rabbi friend said to me after he read the book, that counseling congregants, he sometimes tells them that the opposite of love is actually not hate, but indifference. Writing a book, especially a children's book—even one with a title like I HATE EVERYONE—feels to me a little like sending a love letter out into the world where you never know all the people who might read it. It's my fervent hope that as we go out into our troubled world, we pay attention to hate—and not hate back—but do what we can to turn hate into love. "My little guy goes through moments when he's so mad that he hates everyone and everything. That's why I really liked this book, it reminded me tons of him. This is a very cute book about a little girl that when she's mad gets so upset that she hates everything. My boys and I really liked this book because even while she is saying how much she hates things, she is also showing how much she needs love and care." No, I don't hate everyone. But who hasn't thought and/or uttered that statement at least once? 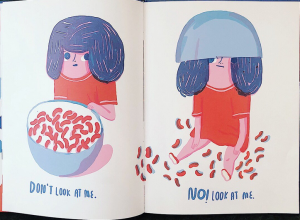 I know I have, which is why I was delighted when author, Naomi Danis, asked if she could send me her new picture book, I Hate Everyone, illustrated by Cinta Arribas.